Open water swimmers have fascinated and inspired many over the last 140 years. Several landmarks and memorials have been named in their honor. 1. Vicki Keith Point is an area at the end of the Leslie Street Spit on Lake Ontario in Toronto, Canada that was named in honor of Vicki Keith. This is place where she made most of her landings after crossing Lake Ontario. 2. The Cliff Lumsdon Park is a park in Toronto, Canada named in honor of Cliff Lumsdon, a famed professional marathon swimmer from Canada. 3. McConica Cove is a small cove on Catalina Island named on 11 August 1989 in honor of Jim McConica, a famed American pool and open water swimmer, who participated in a record-setting relay across the Catalina Channel. 4. Webb Crescent is a road in Dawley named in honor of Captain Matthew Webb, the first person to successfully swim across the English Channel. 5. The Captain Webb Primary School is a primary school, nursery and day care center located on Webb Crescent in Dawley, Telford, Shropshire, England that was named after Captain Matthew Webb. 5. Captain Matthew Webb has a memorial in Dawley, England with an inscription "Nothing great is easy" placed in honor of his 1875 crossing of the English Channel. 6. The Webb House is the youngest of the houses at Adams' Grammar School in England that was named after Captain Matthew Webb. 7. Cape Lynne Cox is a cape on Siberia's famed Lake Baikal located near the Angara River where Lynne Cox became the first person to swim 7 miles from cape to cape in 4 hours 19 minutes in August 1988. 8. There is a federal plaque erected by the Canadian Historic Sites and Monuments Board near the site of Marilyn Bell's finish on her 1954 crossing of Lake Ontario in Canada. 9. A plaque is mounted on the base of a statue of a lion along Lake Shore Boulevard by the Government of Ontario Building of the Canadian National Exhibition commemorating Marilyn Bell's Lake Ontario crossing in 1954. 10. Marilyn Bell Park is a park on Lake Ontario near the finish of Marilyn Bell's Lake Ontario crossing in 1954. 11. The Marilyn Bell 1 is a ferry boat that serves the Billy Bishop Toronto Island Airport and named after Marilyn Bell. The name was chosen as the top name in a contest held by the Toronto Port Authority. 12. The Bert Thomas Monument is a rock structure and plaque on Ediz Hook in Port Los Angeles, Washington that commemorate the site where Bert Thomas entered the Strait of Juan de Fuca on the first successful crossing on July 8th 1955. 13. A statute of Jacques Amyot is located near the finish of the Traversée internationale du lac St-Jean in Roberval, Quebec, Canada on lac St-Jean to commemorate the first person to cross lac St-Jean. 14, In 1946, the inaugural Keo Nakama Invitational was held in the salt water of the War Memorial Natatorium near Diamond Head Volcano on Oahu, the longest-running annual pool swimming meet in the United States named for Keo Nakama, the first person to cross the Molokai Channel. 15. Similarly, the Lakeshore Swimming Club of Toronto held the first Marilyn Bell Swim Classic, a meet sanctioned by Swim Ontario, in 2009. 16. Byron's Stone near Tepelene, Albania is a memorial to Lord Byron, an Honour Swimmer in the International Marathon Swimming Hall of Fame. 17. Byron's Cave or La Grotta di Byron in Portovenere, Italy is another commemoration to Lord Byron. 18. The Statue of Lord Byron in Athens, Greece is another memorial to Lord Byron. 19. The Lord Byron Memorial Stone in Westminster Abbey is a memorial to Lord Byron in the Poets' Corner / South Transept. 20. The Counsilman-Billingsley Aquatics Center (CBAC) is the home to Indiana University swimming, diving and water polo programs and named after famed Olympic swimming coach and English Channel swimmer James 'Doc' Counsilman. 21. The Doc Counsilman Memorial Lecture Series is an annual lecture given by luminaries outside the swimming community at the American Swimming Coaches Association's annual World Clinic and was named after James 'Doc' Counsilman. 22. Buddy’s Buoy has been a fixture in the Pacific Ocean for over 40 years and is a marine buoy located off of the Newport Pier in Newport Beach, California located in front of the Newport Lifeguard Headquarters and named for famed California waterman Buddy Belshe. 23. Dowling College was named after Robert Dowling, the first person to swim around Manhattan Island. Dowling provided a grant of $3 million in 1968, which allowed the Adelphi University campus in Oakdale, New York to become Dowling College. 24. The Gertrude Ederle Recreation Center is a New York City recreation center named after famed English Channel swimmer and Olympic swimmer Gertrude Ederle. 25. A bust of Gertrude Ederle, the famed American English Channel swimmer, was planned for the Sirene Hotel in Cap Gris Nez, France. 26. 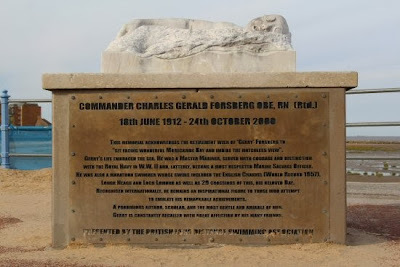 The Memorial to Commander Charles Gerald Forsberg is a monument in Morecambe, England to Commander Gerald Forsberg, an inductee in the International Marathon Swimming Hall of Fame and renowned marathon swimming author and administrator. 27. Annette Kellerman's plaque and collection transferred from the Dennis Wolanski Library and Archive of Performing Arts at the Sydney Opera House to the Powerhouse Museum in commemoration to Annette Kellerman, an Honour Swimmer in the International Marathon Swimming Hall of Fame. 28. Des Renford Aquatic Centre is an award-winning facility located in Heffron Park, Maroubra, Australia that is named after the former King of the Channel®, Des Renford. 29. The Jim Doty Memorial Clocks are posted at the clock tower at the L Street Bathhouse (Curley Community Center) in South Boston, Massachusetts. Named after International Marathon Swimming Hall of Fame Honour Swimmer James Doty the clocks aim to help swimmers training in the harbor know how long they’ve been swimming. 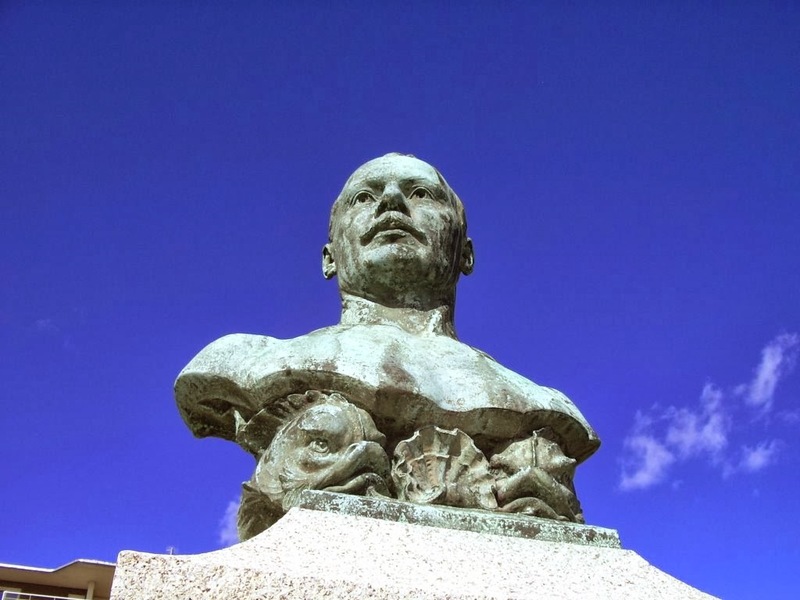 For an updated list of landmarks and memorials, visit here.